Hot Off the Press: Our 2018 Surfaces Catalog is Here! Designed to inform and inspire, our new 2018 Surfaces Catalog sports an updated look and includes all of our newest Surfaces and Design Tools. F+S Surfaces: An extensive and diverse group that includes VividGlass, BermanGlass, stainless steel, Fused Metal, Linq Woven Metal, Bonded Metal, Bonded Quartz and more. Learn a little of the backstory behind each material, peruse swatches for close-up views of our finishes, patterns and textures, and be inspired by examples of F+S Surfaces installed in projects around the world. 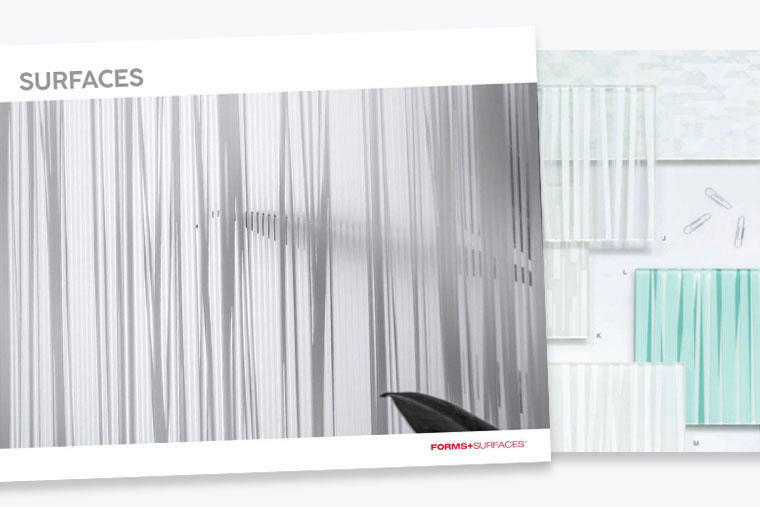 F+S Systems: Our intelligently designed wall cladding, column, and elevator interior systems provide a framework for our Surfaces. Tour this section and you’ll see how easy it is to use our Systems to bring our Surfaces to projects of all shapes and sizes. F+S Design Tools: Our growing collection of easy-to-use interactive configuration and visualization tools. The VEKTR Digital Canvas, Zoom Digital Darkroom and Virtual Quarry give you endless ways to get creative with VividGlass. The Elevator Design Studio spans our entire Surfaces portfolio and invites you to create unique elevator interior designs. Flip through the digital edition above or download it here. Or contact us to learn more from your local F+S Territory Manager.